"What these robots are really tapping into is simulated feeling and simulated empathy, and I think we are playing with fire when we offer them to our children." They are reading to kids, singing lullabies to them and even taking naps with them. Artificial Intelligence (AI) toys are coming into our homes, and these friendly robots are becoming more and more sophisticated — and raising concern for tech watchers. "A big danger is to have misconceptions and trust too much what the device is saying," Stefania Druga tells The Current's host Anna Maria Tremonti. An MIT study that looks at how children perceive and interact with the AI toys and robots found children between the ages of three and six were not sure just how smart the robots were. However, the kids aged six to 10-years-old, always thought the robots were smarter even when they didn't know the answers to their questions. "A lot of times the children wanted to teach things to these devices. They wanted to teach their name or favourite colour; they felt the need to have real conversations with these agents," says Druga, co-author of the study and research affiliate in the Personal Robots Group at the MIT Media Lab​. Although the study shows that kids do not want the devices to replace their family or friends, it also shows how children can develop emotional ties with the robots, which was cause for concern for the MIT researcher. The tendency for kids to see the robots and devices as friends is exactly the problem for many tech watchers. "What these robots are really tapping into is simulated feeling and simulated empathy, and I think we are playing with fire when we offer them to our children," MIT professor Sherry Turkle tells Tremonti. CBC News: When your robot learns from humans, who should train it? Turkle, director of the MIT Initiative on Technology and Self, which looks at how humans react and interact with technology, tells Tremonti that she is against AI devices and robots that pretend to have feelings or thoughts very much like humans and that for her the deception of kids is the problem. "When a child meets a robot that asks the child to take care of it or nurture it, then the child will connect to that robot as though it were a person," she says. Turkle makes a distinction between stuffed animals and AI robot toys, saying there is a huge difference between a child pretending with an AI toy because "these toys come to the party with personalities of their own." "Simulated feeling is not feeling. Simulated love is not love; it never gives real empathy." But some AI robot creators say they are not necessarily interested in making their robots lifelike as much as they are in making them familial and relational. Cozmo, the robot, created by Anki Robotics, a Silicon Valley robotics company, does not look like a human, and his voice is not human- like either. Cozmo looks very much like a character come to life which is exactly what the makers of Cozmo were hoping to create. "The key to Cozmo is the personality. 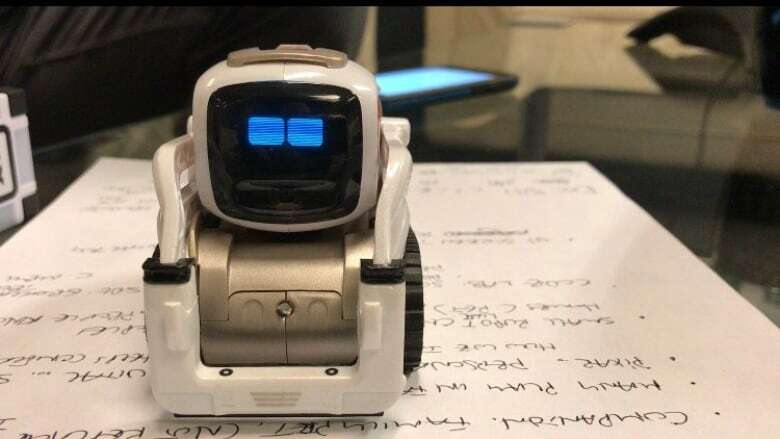 Cozmo's personality ... continues to evolve the more you hang out and play with him," says Mark Humphrey, spokesperson and director of sales for Anki Robotics. The company hired experts from Pixar Animation Studios to bring out the robot's personality. Humphrey is also a father of two boys and tells Tremonti that he is not worried about his boys playing with the robot or forming a bond with it. "Certainly there is more of a bond between my kids and Cozmo, but it's a fun playful relationship just like it is with the dog that we have."